Patellofemoral Pain Syndrome (PFPS) is one of the most common musculoskeletal disorders and is reported to affect 15%-33% on adults and 21%-45% of adolescents, with more incidence on girls. It is the cause of 25% of all sports-related knee injuries. Although the cause of PFPS is obscure, it is accepted as being secondary to chondromalacia or to patella malalignment, in which the symptoms are the result of excessive patellofemoral joint stress due to abnormal patella tracking, resulting in inflammatory pain. 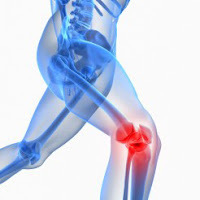 The symptoms can include stiffness or pain, or both, in prolonged sitting with the knees flexed (“theater sign”), and pain in activities that stress and load the patellofemoral joint (climbing or descending stairs, squatting or running. It is normally described as a pain located “behind”, “underneath” or “around” the patella. Most patients can have difficulty to locate the pain, drawing a circle with their fingers around the patella (“circle sign”), or pointing to the anterior aspect of the knee. The pain is usually described as “achy” pain, but it can be a “sharp” one. These symptoms are normally gradual, although they can also be caused by trauma, and bilateral. Patients can complain of a feeling of the knee giving away, due to the inhibition of the quadriceps muscle, because of the pain or deconditioning. A “popping” or “catching” sensation may be described. Its cause is multifactorial, such as abnormal lower limb biomechanics (abnormal Q-angle), soft tissue tightness or laxity (decreased flexibility or the iliotibial band and quadriceps, or generalized ligamentous laxity, hypomobile or hypermobile tenderness of the lateral patellar retinaculum, patellar tilt or mediolateral displacement), muscle weakness (quadriceps, hip abductor, and external rotator weakness), excessive exercise, which may result in increased cartilage and subchondral bone stress, patellofemoral pain, and subtle or more overt patellar maltracking.